It is not a secret that painting your cabinets, at least in Denver, has become a very hot commodity. If you haven’t done it already, you probably have some questions. I get questions about painting cabinets from all over the country; from designers, homeowners, and even from other painting contractors. So, let’s talk about some of the most common questions when it comes to painting cabinets. Is painting cabinets just a fad? Will I want my stained wood cabinets back in a few years? I get this question a lot, especially when we paint cabinets white. My answer is that white cabinets are just like a little black dress. They are classic. Yes, they may be what’s hot right now, but since I have been an adult, white kitchen cabinets have been hot at least three times. 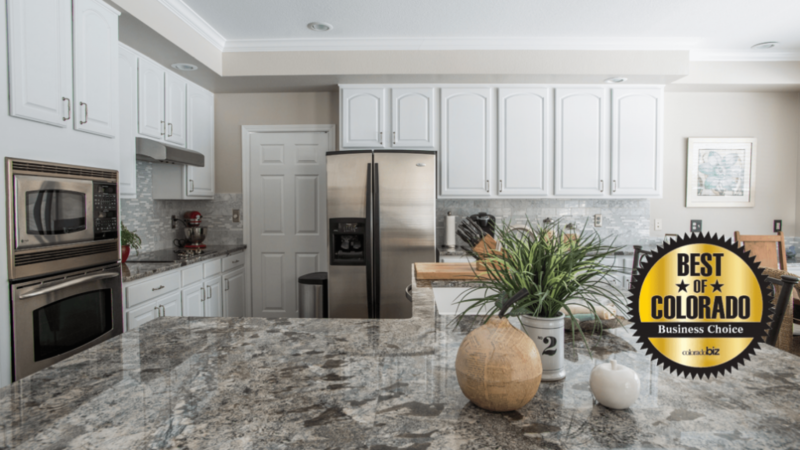 Also, if you decide you want to change the color in a few years, once you’ve had your cabinets painted the first time, it is much less expensive to change the color… about half the cost. A white kitchen is classic though and will be in style for quite a while. Besides, a majority of the cabinets we paint are oak… I can almost guarantee you that oak cabinets, unpainted, will never come back as a HOT style trend (and I’m not sure they were ever on trend, to begin with). Will painting my cabinets last? Will they chip and peel? This is a very valid question, one that should make you do your research before you jump in. A painted cabinet can last a long time if it is done correctly. The problem is a lot of painters and homeowners do not know the right way to paint cabinets. How do I know this? I’m in painter chat rooms, I have been asked to redo lots of failed painted cabinets, and I’ve walked through houses just placed on the market with half-assed painted cabinet jobs. Yes, it is EASY to paint them the wrong way but takes much more time and energy to do the research and paint them the proper way. 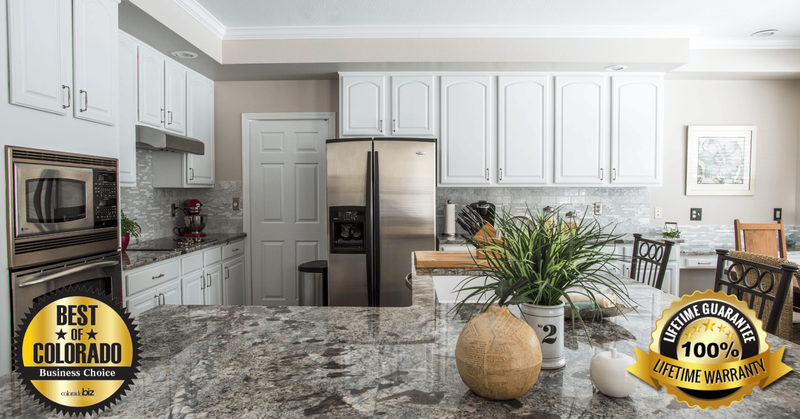 We give our customers a LIFETIME warranty on all of our painted cabinets… and we do free touch-ups for as long as our customers live in their home. So the answer is they can chip and you can have failure BUT, the good news is, if you do the proper steps (and I will get into that in a bit), they will stand up quite well to everyday life. Do I need to clear coat over the paint to protect them? Please do not do this! If you select the right finish paint, you will have a hard surface that will not easily yellow. I was called out to see a set of cabinets last year that had yellowed almost immediately after another company painted them. The homeowner showed me the color she had selected (a very clean and bright white) but her cabinets we a dingy off-white yellow. She was so disgusted. I told her we could repaint them, but it was going to cost more than she paid previously for the other job that didn’t work out. So do it right the first time! How long does it take to paint our cabinets? That depends on the process. The typical painting contractor will do one of two things. They will either take over your garage to paint in or they will take your doors and drawers to their shop. In either case, you can expect the average kitchen to take about two weeks. At Walls by Design, our average kitchen takes about a week. This is because we bring a mobile spray booth (a 20-foot trailer) to your house and spray all the doors and drawers inside it. This system has enabled us to be super-efficient and provide a superior end product. Can I keep using my kitchen during the process? Again, that depends. If the company you hire is spraying your boxes they will have to tent off the area; they will cover everything in your kitchen completely with plastic. Often times, you will not be able to use it for 3 to 4 days. If they are spraying a lacquer, you will want to leave your home for 3 to 4 days. With the process we use at Walls by Design, you can continue to use your kitchen throughout the process, minus the time we are in it prepping and painting… you just won’t have your doors and drawers for 4-5 days. Can you paint the end panels that have laminate on them? It’s not real wood but yes. We have painted hundreds of kitchens now, and have not had one failure to report. If your painting contractor uses the wrong type of primer though, you will have more problems other than just the end caps. How do you prep the cabinets so they last? Dismantle everything. We mark and take everything apart. I saw a kitchen once that was getting sprayed. They opened all the doors, taped off the hinges, and let the paint fly. As you can imagine, it was not a pretty site. Buff sand all surfaces. Not a heavy sand, just a light scuff to break down the finish a little. Wipe down all surfaces with a de-glosser. This is simply a very strong cleaning agent, and does two things for us: Gets rid of all the dust we created with sanding, and further etches into the finish. Paint does not like shiny surfaces. If it doesn’t have anything to hold onto, it will release. Most painters only like to wipe down with the de-glosser, and not sand, but we feel these are two very important steps done together that cannot be missed. Prime with a bonding primer. This is one of the biggest areas of failure by most painting contractors. They simply do not understand what a bonding primer is compared to any other primer. We see Kilz used a lot, but typically not the Kilz bonding primer. We like a product called Stix. It is made by Benjamin Moore, and will literally stick to the glass. Then, if we have an oak cabinet or a dark stained cabinet we use another primer called Fresh Start, also by Benjamin Moore. This helps seal the grain of the oak and/or block any stains. We apply a heave rolled coat onto the oak cabinets, then spray two more coats to get the best coverage. Can you get rid of the grain I see on my oak cabinets? Yes and no. Yes, it is possible. They make some putties and fillers that will do the job, but it is very costly. We find that most people want to paint their cabinets because it cost WAY less than replacing them. If you try to fill the grain and make them smooth, it will cost you as much as if you replaced the doors. Almost anything is possible, but some things are just not practical. These are the most common questions we get about painting cabinets in Denver. If you have additional questions, we would love to answer them. Contact us via our website, call in, or message us on our Facebook page. Some of our customers like to see finished cabinets prior so we gladly invite you to visit us at our office where we have actual cabinets we have painted. Unfortunately, we cannot bring you into other clients’ homes to see their cabinets…that would be weird. We have both smooth doors, as well as oak doors that we have painted using the same process we would use in your home. If you would like to see additional pictures, please check out our Facebook page, as most of our projects get uploaded there.